Pasta and greens have to be one of my favorite combinations in the world. Toss them with avocado, green beans and some dried fruit, and you have yourself a real winner. I was certainly in need of a big salad this week after all of that pulled pork (which by the way, there is still some left of in the fridge). This salad hit the spot. It’s really not anything special, unless you consider a homemade apple vinaigrette to accompany it, pretty special. In this case, the dressing totally made the salad. Speaking of vinaigrette, I’m a dressing freak. I’m that odd ball in the restaurant that actually likes when they dump a bunch of dressing on top instead of serving it on the side. I like every single green to be coated in dressing. I know. It’s weird, but it’s one of those faults I have decided to learn to live with. We’ve paired this light summer salad with a great summer beer: Boulevard Brewing’s ZON Belgian Style-Witbier. This is Boulevard’s seasonal brew and it is spectacular. Try pairing these Green Bean and Avocado Summer Salads with a light, summer beer. You will be so happy you did. …Just to name a few. =) You get the point. So the reason I decided to go with Boulevard Brewing’s ZON Belgian Style-Witbier was because it’s such a great Summer beer. Not only is it’s Boulevard’s Seasonal, but it’s light and refreshing. It’s a beer that certainly needs to be gobbled up when it’s distributed, since you have to wait a whole year until you get to see it again! I hate when they do that…yet, I love it too. You get perfect hints of citrus, that it literally has you craving an orange. It’s refreshing and light and absolutely perfect for those hot summer days. I hope everyone has a lovely Father’s Day weekend. Cook/Bake something fun! These green bean and avocado summer salads are packed full of the great flavors of Spring and Summer. In a small saucepan, heat the 1 tablespoon of olive oil over medium heat. Add the shallot and cook for 5-6 minutes or until tender. Add the garlic and cook for another minute. Add the apple juice and apple cider vinegar and cook for another 5 minutes on high, or until the liquid is slightly reduced. Remove from heat and whisk in the dijon mustard, extra virgin olive oil, salt and pepper. Whisk until smooth and all of the ingredients are combined. Cover and refrigerate until you are ready to use. Bring a large pot of water to boil over high heat. Salt the water and add the pasta. Cook until al dente, about 7-8 minutes. Remove from the stove. Drain the pasta and rinse with cold water. Set aside to cool completely. Meanwhile, prepare your green beans. Combine the green beans and about 1 cup of water in a medium-sized saucepan. Heat the beans over medium until they are hot. Remove the beans with a slotted spoon and transfer immediately to an ice bath (a bowl of water filled partially with ice). Let sit for 2-3 minutes then remove the beans, again with a slotted spoon, from the ice bath and transfer to a paper towel lined plate to get rid of any excess liquid. Set aside until you are ready to use. 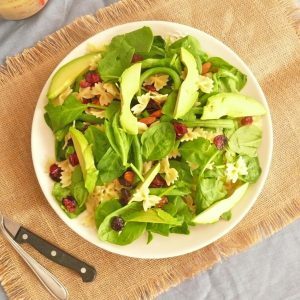 Combine the pasta, beans, cranberries, raisins, almonds, and spinach in a large bowl. Toss the ingredients to combine then portion out 6 servings of the salad. Top each salad with sliced avocado and serve the dressing on the side or lightly drizzle over top. Great recipe! I’ve tried it yesterday and I loved it!